From the back cover: "The Emerald Cloak begins in Northern Ireland, County Tyrone, in 1830, when the prime character, Molly O'Connor, is five. By 1846 she is an accomplished healer with a young family, and together with the Dermitt family, emigrates to Canada in search of a better life..."
This was such a good book. It is well written and it's by a local author too. I am reserving this for my Two Worlds Virtual bookbox. Enjoy this book, bookguide! It's on its way by surface mail (six to eight weeks time). Together with 'Silences of the Heart', 'The Emerald Cloak' arrived today on a sunny April afternoon after six weeks in an envelope, and a journey halfway round the world. I've just finished reading 'The Other Side', about an Irish family which emigrated to New York, which I am about to send to you, as you chose it from the Two Worlds Virtual Bookbox. It will be interesting to compare the two. Thank you for sending these books; I'm looking forward to reading them, but they will have to wait until I have waded through the bookring swamp first. You can check my progress on my profile, where I list my ringbooks in order of arrival, and update the TBR number, which is not necessarily the same, as some are more "urgent" than others due to numbers of people waiting to read. Oh dear. I hate to break this to you, Loveamystery, but I thought this book was terrible! I only read to the end in case the plot was better than the writing, and because you had gone to the expense and trouble of sending it so far, so it seemed churlish not to read the whole thing. Initially I wasn't gripped by the style of writing, but I was hoping it would improve as the book progressed. However, although the book covered a period which should have been interesting, and the events described are worth reading about, there wasn't enough detail or character development to make the book worthwhile. I'd advise anybody wanting to know about the hardships on board the cross-Atlantic ship journey to watch the film 'Titanic', and indeed the story which I'd previously read about another Irish family setting up life in Canada came much more alive for me than this, with more fascinating details about pioneer life. The only redeeming feature was the fact that there were some interesting facts about quarantine camps, and the numbers of people who died or became ill on board the ships from England. Apart from the fact that it irritated me that the majority of the names were so overtly Irish (Molly, Kathleen, Patrick, Sean, etc. ), there was even a Colleen, which is a name no *real* Irish family would give a child, as it is the Irish for girl; only wannabe-Irish use this name. Then there is the entirely unoriginal naming of the ship's Captain and doctor, Captain Morgan and Dr. Findlay; honestly, I laughed and laughed (Captain Morgan is the name of the rum, and Dr. Finlay's Casebook was a very famous British radio and TV programme in the 1960s and '70s). 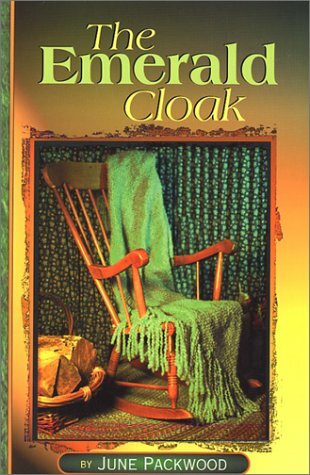 The book is called 'The Emerald Cloak', but the cloak hardly features, and the cover photograph is of a shawl. Added to the ForeignExchange book boxes. Taken from ForeignExchange boxes for wild release in England. Left on a bookswap shelf by the customer service desk in HomeBase.